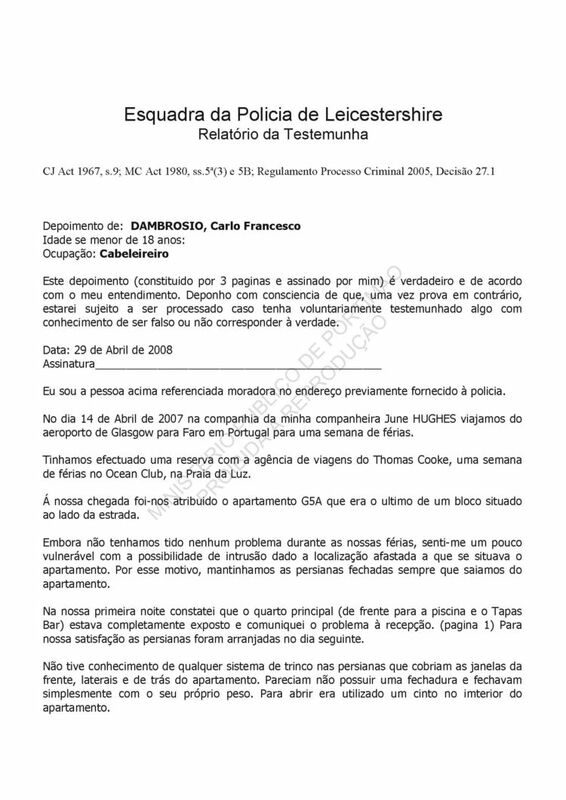 42 to 43 Witness statement of Carlo Francesco D'Ambrosio (former holidayer in Apartment 5 A) 2008.04.29. This statement, consisting of three pages, each signed by me, is true to the best of my knowledge and belief and I make it knowing that, if it is tendered in evidence, I shall be liable to prosecution if I have willfully states in it anything I know to be false or do not believe to be true. I am the above referenced person and live at the address previously given to this police. On the 14th of April of 2007, in the company of my partner, June HUGHES, we travelled from Glasgow airport to Portugal for a one week holiday. 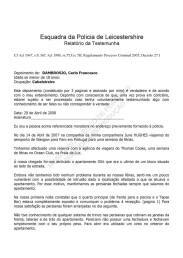 We effected the reservation with the Thomas Cook travel agency; a week of holidays in the Ocean Club, Praia da Luz. Even though we did not have problems during out holidays, I felt a bit vulnerable with the possibility of a break-in given the location of the apartment. For this reason, we would keep the blinds closed every time we left the apartment. On our first night I noticed that the principal room (in front of the pool and the Tapas bar) was completely exposed and communicated this problem to the reception. (Page 1) To our satisfaction the blinds were fixed the next day. I was not aware of any locking system for the blinds that covered the front, back and side windows. It did not appear possible to use a lock and would close on its own as a result of its weight. In order to open it, you needed to use the interior belt system. I verified that all the blinds worked correctly. We would always enter and leave the apartment through the main door with gave way to the parking area and the street. We did not use the pool-side doors as it was not possible to close them from the outside. It was get very dark outside our door and that left us a bit scared. The darkness was due to a faulty/wasted bulb. It was only myself and June in the apartment and for this reason we did not have any contact with the Creche or child services. We only breakfasted in the apartment and would dine always outside the resort. We never used any restaurants in the Ocean Club. 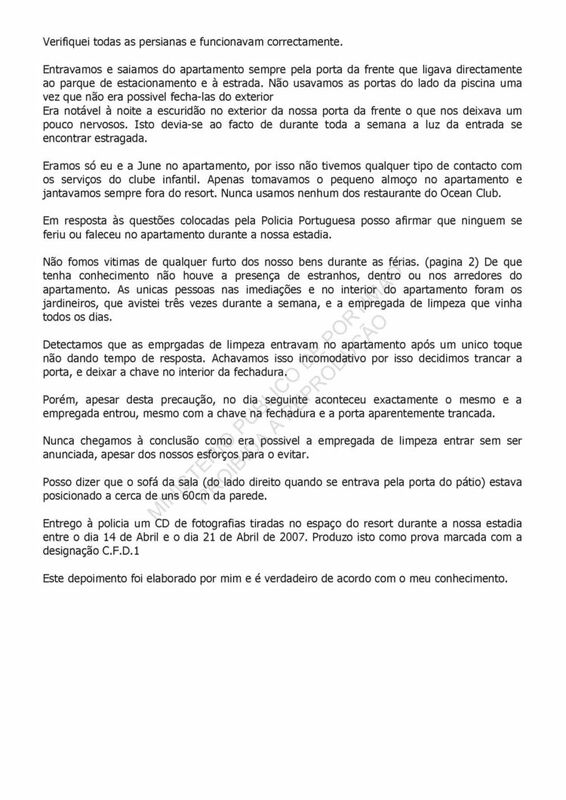 In response to the question asked of me by the Portuguese Police I can affirm that nobody got hurt or died in the apartment during our stay. We were not victims of any break-in (page 2). According to what I know, there was no presence of strangers, inside or outside the apartment. The only people in the immediate areas of the apartment were the gardeners, whom I saw three times during the week and the cleaning woman who would come every day. 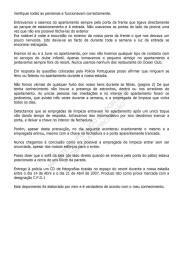 We noticed that the cleaning personnel entered the apartment after one knock and did not give us time to respond. This was a bit bothersome and for this reason we would lock the door, and would leave the key in the inside lock. After this precaution, the next day, the same thing happened and the cleaning woman entered even though the door was locked with the key in the lock. We never found out how it was possible for a cleaning woman to enter after we had tried to prevent it. I can tell you that the living room sofa (to the right when on entered via the patio door) was positioned about 60 cm away from the wall. I give the police a CD with photographs taken in the space and the resort during our stay between the 14th of April and the 21st of April of 2007. I have produced this marked as C.F.D.1. This statement was elaborated by my and in truthful in accordance with my understanding.